All active kids will love the ECR4Kids’ Tree House! Whether mountaineering up the ladders, sliding down the wavy slide, enjoying time on the bench or playing within the sand pit, kids can have a blast on the durable Tree House for long-lasting indoor and outside use. Parents will love the easy to clean multipurpose Tree House. The Tree House is fun for indoor or outside use! The fun climber features apple trees on both sides, so kids will feel like they’re in point of fact in a tree house. Two side ladders make it easy to get admission to the platform, reach the tree tops and wavy slide. Take a break from mountaineering and sliding on the sturdy bench with a backrest, conveniently situated behind the tree house. The multipurpose table reverses to develop into a sand pit. The possibilities are actually endless! The fully functional Tree House has the whole thing a child needs to spend time with friends. One by one, kids can climb to the top on either side on the bright orange ladders. They’re going to love sliding down the wavy purple slide. 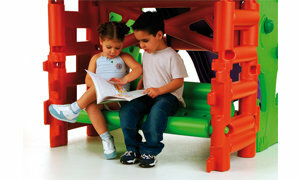 Kids too can gather for reading, activities or lunch the use of the table and bench. That’s not all; the reversible pieces can develop into an active sand pit where children can interact with sand toys letting their imaginations run wild. This multi-purpose Tree House is great for active play, helping little ones get exercise, at the same time as the use of their imagination and building social skills. Ladders, Slide, Bench And Sand Box Offer a Number of Activities! Two side ladders for mountaineering up the platform and sliding down the slalom slide. The Tree house includes a collapsible bench for playing on the table or sitting on. Reversible section can also be was sandpit. Weather resistant; adult supervision advisable. Each Tree House includes able to collect apple trees, purple slide, ladders, table and bench. Directions and all essential tools to collect.